For more than 10 years, the Thomas J. 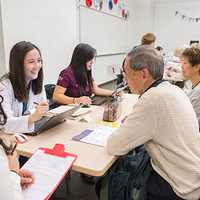 Long School of Pharmacy and Health Sciences has been assisting Medicare beneficiaries in evaluating their prescription drug plan options under the Medicare Part D benefit., providing an objective, unbiased and reliable resource through annual outreach events during Medicare open enrollment. Other services include medication review and a variety of health screenings and information.